Morning tea-table on Tuesdays brings me regularly two visitors – Amar and Reeves, former a sports enthusiast and latter, a well-known attorney. 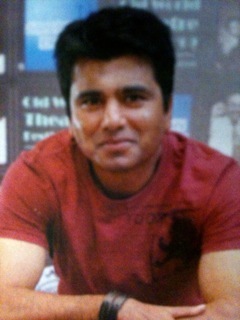 For the past few weeks, Rajesh Gopie has also been joining us at the tea table. For those especially abroad who may not know him, let me simply tell you that he is a playwright-director. 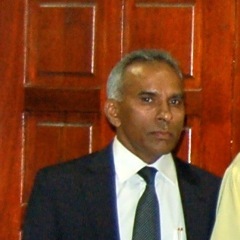 He is also well known locally as a stage, TV and a film actor. His next-door boyish looks indeed is deceptive. When he talks, his eyes spell out the emanating emotions. His recent production “The Coolie Odyssey” has been receiving rave reviews here. It presents the history of three generations of Indians in South Africa, the journey of our forefathers, the ‘indentured labourers’, ‘like no other told in this country’s theatre history’. Plays, musical melodies, cultural extravaganza, and many more media – all vie with each other in commemorating the 150th year of our ancestors’ arrival in this land. Rajesh aptly told me that all these attempts were nothing but ‘to make sense of who these forefathers were’ and simultaneously ‘to connect them to who we are today’. A very appreciable attempt indeed! And today there still are organisations that were started by the first or second generations. We at the Ramakrishna Centre were interested to know how these institutions have tried to enrich the community spiritually. The result was a Public Meeting. It is said that when our forefathers came from India in 1860, they landed at Port Natal empty-handed. We forget to note that, yes, empty-handed perhaps but not empty-hearted! When they moved into the shores of South Africa what came with them was the pristine spirituality and priceless culture of that ancient land – India. If there is any land on this earth that can lay claim to be the blessed Punya Bhumi, to be the land to which all souls on this earth must come to account for Karma, the land to which every soul that is wending its way Godward must come to attain its last home, the land where humanity has attained its highest towards gentleness, towards generosity, towards purity, towards calmness, above all, the land of introspection and of spirituality — it is India. From this land came our forefathers 150 years ago. The first ship, s.s. Truro, brought 341 immigrants. For Indians in South Africa, this day, i.e. 16 November, has great significance – not only in remembering and paying homage to those undaunted souls but also to draw lessons from them so that the future course of our life stands well-guarded. 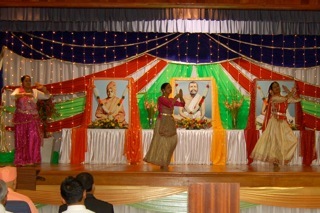 In commemoration of this historical event, our Centre organised a program, held on 13 November at Nischalananda Hall. The program included speakers from 5 organisations, with inaugural address by self and closing comments by brother Swami Saradaprabhanandaji. During these three and a half years of my stay in this country, I have been quietly admiring one wonderful quality of the SA Hindus, i.e. the intelligent adaptability to the ethos of this foster nation which has become the new-found Motherland. While patronising this praise-worthy element of patriotism, I spoke on the need to preserve a unique religious identity – only because the Hindus never in their history have anywhere spread their ideas either with a sword or with power or pelf. They have been all the time peace-loving and wherever they have gone, whether as immigrants or as tourists, they have, like the unseen dews of the early morning, contributed to the promotion of amity and harmony. This was largely made possible because of adopting a life-style on the basis of Dharma. I added that if dharma is maintained at all costs, that dharma alone will protect the Hindus — ‘dharmo rakshati rakshitah’. Another feature I spoke in praise of was the spirit behind the present grand achievement. Though being a minuscule minority, the presence of Indians is palpably felt in all walks of life such as Law, Medicine, Education, Engineering and the ubiquitous IT. Marked economic advancement makes us feel proud of our progress. In this connection, I recalled the caution that Swami Vivekananda gave to his countrymen – that ‘neglect of masses’ is the foremost reason for the downfall of India. I added that concerted efforts must be co-ordinated by the Hindu community. They should disperse all possible resources in caring and sharing for the multitude living in the densely populated areas. Otherwise it would definitely be a cause for deep concern. I must hasten to add here that no one should come to the conclusion that no welfare work is being done by the Hindu organisations. For the last nine decades, as per the 6th/9th principles of the Arya Samaj, the Aryan Benevolent Home Council has been rendering yeomen service to the community, especially to the aged and orphans. The Council runs several permanent institutions that are indeed a model to the society, said Sri R Bindapersad, the President of the Council, who explained in detail about each of the institution’s activities. 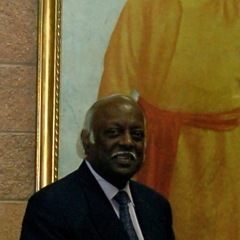 Inculcating dharmic principles in individual lives was stressed by the late revered Swami Sahajanandaji Maharaj, said Sri Bala Natesan and Sri Shivaprem, co-chairmen of Divine Life Society. They enumerated such principles as brahmacharya, prayer, rights and wrongs in workplace and on the roads, spiritual readings etc. They emphasised on the meaningful relationships that should be developed and maintained between the members of the family. It is noteworthy that the DLS has so far completed 400 social welfare projects and more than 10,000 ash-disposals have been done at Sivananda Ghat, a place used by Hindus of all denominations. Dr J V Viranna, representing Sri Sathya Sai Central Council, gave a bird’s eye-view of the Value-Based Education in the Society. He said that without individual transformation, social peace cannot be achieved. He went on to describe how the intellect should be utilised in reaching the goal by comparing buddhi to a bird: Satyam and Ritam are its wings, Shraddha its head and Yoga the Tail. All these must be combined so that the bird may soar with ease. He said that according to Sri Sathya Sai Baba advancement in technology would not bring happiness. Love is essential; that must be the undercurrent behind every activity. 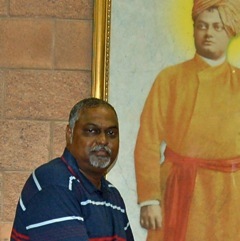 ‘Faith in oneself and faith in God is needed to get success’ is an oft-quoted saying of Swami Vivekananda. 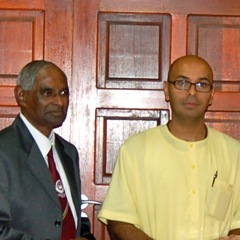 One of the oldest Hindu organisations, Saiva Siddhanta Sangam, promoting Religion, Culture and Social Welfare, was represented by Sri T Murugan. He narrated extensively the turning point in the life of the Founder, the late Subrahmanya Guru Swamigal, who tirelessly spread the message of Faith in Lord Shiva everywhere. It was amazing to listen to Sri Murugan when he stated how Guru Swamigal, by his power of pranayama, lived one full day buried under the earth – and came out unscathed. Hunger and thirst are the escalating factors in the sufferings of the masses, and the source of hunger is poverty. 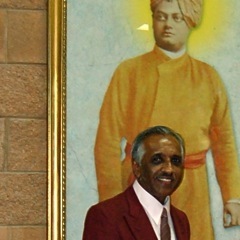 ‘Is there any cure for this worst malady?’ asked Sri Ramesh Ishwarlall, the Chairman of the Ramakrishna Centre of SA. He answered it by saying that two factors, namely, being industrious and getting educated, were the best ways to overcome this disease. He emphasised that all external service activities were to be carried out in the spirit of worship. 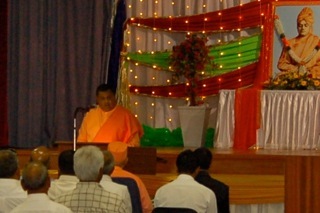 While giving his presentation that detailed eminently all the varied activities of the Ramakrishna Centre, he advocated the policy of being ‘deeply Hindu and proudly South African’! Listening to more than two and half hours of learned speeches, I was grappling with the difficulty of getting to my memory the salient points of each exponent. And right there came the help! In his inimitable way, brother Swami Saradaprabhanandaji rounded off the whole program with a brilliant summary. He pointed out that the progress of the nation presupposes the involvement of all communities. He further stressed on the need for a harmonious society that would pave the way for peaceful living. Then only will the best talent of each individual be manifested. The Ramakrishna Centre has been always promoting Hindu culture through encouraging our children imbibing traditional music, dance etc. The students of the Nateshwar Dance Academy, in their splendid performance of the dance items, caught the attention of the public. Each dance in the classical style charmed everyone. With the passing of time, the legacy of the arrival of our forefathers seemed to be forgotten annals of history. The 150th year of the Arrival of the Indians, has resurrected the story of our ancestors. A new beginning….. their determination to succeed in a new land bears testimony to our present religion, education, culture and uplifting the poor. So many heartaches to reach their dreams, but our forefathers “stood the test of time”. May I take this opportunity of paying tribute and humble respects to our ancestors who paved the way for a better life for all Indians in South Africa and made us “Proudly South African”! 16 November 1860….. A day all South African Indians will cherish with tears of sadness and joy. Thank you Revered Swamijee for an unforgettable post! Similar to the “soccer fever”, there is over all wide broadcast of the 150th anniversary of the Arrival of the Indians here. There are celebrations, remembrances and tributes at all Indian organisations. Adult, Youth and children are participating in dramas, songs and dances in remembering their forefathers with mixed emotions. Indeed a day to honour! Who else can rekindle the legacy of the past but you. Thank you for keeping us well informed of the past, the present and yes, the future. Yes, by Masters Grace the body-mind is doing fine. Truly speaking the inspiration came from the readings about the ‘Indentured labourers’ in SA. Their insurmountable struggles, unthinkable hardships, tears and triumphs all prompted this whole exercise. With regards to the future…to adapt Swamiji’s words…Man is the Master of his own destiny. Your article, ‘Legacy Lessons’, is highly educative to me. It is so enlightening to learn that there are so many Hindu based South African organisations who are working in harmony with each other. The spirituality is the golden thread which is binding the organisations together. I am very grateful to you for the opportunity to enlighten us. 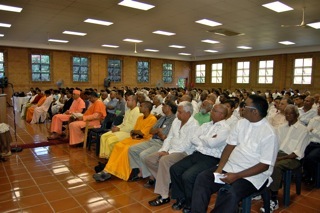 Wish I was in the Public Meeting of Legacy of the Hindus in SA! I was hoping that you pay a visit to South Africa some time soon. Yes, the program held at the ashram was both educative and very informative for me as well. Having listened intently to all the speakers, my immediate thoughts were to publish a post on the proceedings in the meeting. Good to note that this has received your hearty appreciation. Yes, indeed our forefathers may not have come with any material possessions but they came with a 5000 year old culture and way of life that helped them survive the hardships they had to face. What really inspired me about Saturday’s program was that the Presentations placed before the youth how our forefathers practically lived out the values of our dharma. Their selfless service and devotion are worthy of emulation. What really worries me, is how our current generations are living devoid of these value and cultural systems. My prayer is for Master to help inspire our generations to lead a dharmic life. Contribution to the worldwide Indians, be they Hindus, Christians or Buddhists, by our Ramakrishna centres is unparalelled. Its contribution to Hindus in particular is tremendous. 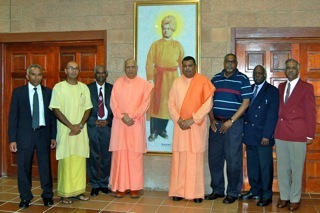 Our Vedanta centre at Durban seems to have united several denominations of Hindus under one roof and it is true to the vision of Sri Thakur, Sri Ma and Swamiji. See how splendidly Swamiji defines India!! A man can reach the roof of a house by stone stairs or a ladder or a rope-ladder or a rope or even by a bamboo pole. But he cannot reach the roof if he sets foot now on one and now on another. He should firmly follow one path. Likewise, in order to realize God a man must follow one path with all his strength. But you must regard other views as so many paths leading to God. You should not feel that your path is the only right path and that other paths are wrong. You mustn’t bear malice toward others. By reading this, I was realising man can reach the roof only by the help of GOD or by the blessings of Sri Ramakrishna. Without that we are nothing. When the flood comes, it overflows rivers and streams, and makes one watery surface of all adjacent lands. But the rain-water flows away through fixed channels. When the Saviour becomes incarnate, all are saved through His grace. The Siddhas (perfect ones) only save themselves with much pain and penance. When a mighty raft of wood floats down a stream, it can carry a hundred men, and still it does not sink. A reed floating down may sink with the weight of even a crow. So when a Saviour becomes incarnate, innumerable are the men who find salvation by taking refuge under Him. The Siddha only saves himself with much toil and trouble. The locomotive engine reaches the destination itself, and also draws and takes with it a long train of loaded wagons. So likewise act the Saviours. They carry multitudes of men, heavily laden with the cares and sorrows of the world, to the feet of the Almighty. I am surprised to know from your blog that you have completed 3 1/2 years in south Africa. How time passes! It is as if the other day I participated in the Jagaddhatri Puja at Ranchi Sanatorium with you. Any way, Sri Sri Thakur has sent a right person in you to lead our Centre there along with Revered Swami Saradaprabhanandaji Maharaj. I had seen him once in Belur Math, what an elegant personality by physique and soft hearted inside! I am glad that both of you are doing wonderful work in spreading the message of Sri Sri Thakur, Ma and Swamiji in that part of the globe. You had arranged such a nice program and provided an opportunity wherein all people could remember their ancestors and take pride in their legacy. Here, at Ponnampet Ashrama, we are keeping well and Revered Jagadatmaanandaji is tolerably well for his age. He is conducting regular classes for the devotees and occassional lecture programmes outside. Recently we conducted Anniversary of Dedication of Universal Temple of Bhagavan Sri Ramakrishna at Ponnampet. 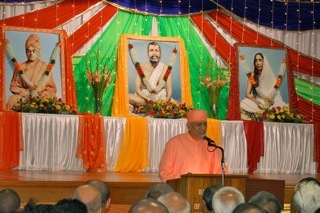 There was two-day function on November 14th and November 15th (Jagaddathri Puja). On 14th there was a Youth Convention wherein more than 800 students participated from different colleges of Kodagu District and in the evening, there was special bhajans programme by Swami Swatmaramanandaji of Bangalore Math. On 15th, Anniversary program included special puja, bhajans, Parikrama around the temple by Sadhus and devotees with Vedic Chanting, bhajans and dancing. Jago Bharat (A Cultural programme) by Sri Sulebele Chakravarty and Party, Harikatha were special items There was a public meeting also wherein Revered Swami Sureshanandaji Maharaj, Revered Suhitanandaji Maharaj and other monks and several dignitaries were present. We gratefully remember your support (financially and other wise) in the success of the Consecration of Temple last year. Kindly visit Ponnampet during your visit to India.